Able Electric Service came to Dallas Website Design interested in making a number of updates to an existing website. The website was very old and dated and some of the changes they wanted would have been very difficult and costly to make, because the website had been built almost 2 decades earlier with old and obsoleted technology. Able Electric Service decided that a complete overhaul was in order. We began by creating several design concepts for them, and once we had a design concept that everyone liked we began building their new website. 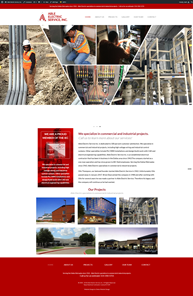 The website was built within the WordPress Content Management System using Responsive We Design Technology, so that the new website would display correctly in any browser and on any device, and the client would be able to easily update, add to or make changes to the website. Once the website was fully developed we then optimized the images, content and coding so that the website would load quickly and rank as high as possible in Search Engines. GTmetrix is popular website that analyses website performance and speed. The image below is a screen capture showing the performance score and page load speed for the Able Electric Service website. The end result is that Able Electric Service now have a modern website that will display correctly on a desktop, notebook, smart phone or any other device, that can grow and evolve with them as needed, and a much more attractive presence on the web.